The Lian Li Strimer combines an industry standard 24 pin power extension cable with an RGB LED lighting module. It is a unique product that has been designed by Lian Li in collaboration with famous PC modder der8auer. Unlike any other cable extender currently on the market, the the Lian Li Strimer, features fully addressable RGB lighting strips. Each wire can be individually controlled and set to a unique colour. Lian Li have developed a multitude of unique lighting modes for the Strimmer but it can also be addressed directly utilising your motherboards 3 pin 5V RGB header. This makes the Lian Li Strimer perfect for the modding enthusiast looking the latest accessory. Created in cooperation with professional overclocker der8auer, the Lian Li Strimer offers new possibilities in RGB illumination. Never before has there been a way to illuminate your PSU cable! Lian Li created this innovation through intelligent engineering. The Strimer is constructed in two layers. 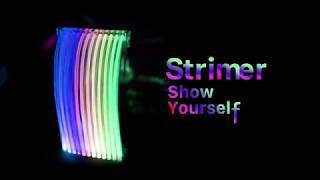 The bottom layer is a standard 24 pin power extension cable, that works with virtually any motherboard while the top layer consists of twelve individually controllable RGB lighting cables.This means the Strimer is both a fully functional power extension cable and can create striking lighting effects. The Strimer’s design has also been carefully considered. The bottom layer is braided and has a soft white colour which compliments the top layer when illuminated. The top layer neatly clips to the bottom via cable combs, which is particularly useful when setting up the Strimer inside your case. Lighting effects can be controlled via a bundled PCIe bracket that connects to the Strimer. Lian Li have included several preset modes and these are accessible with a press of a button on the PCIe bracket. Alternatively the Strimer can be synced with other lighting components by attaching it directly to a compatible motherboard. Lian Li have made an innovative RGB LED lighting accessory that's great for someone looking for something different. More links for "Strimer RGB 24 Pin Motherboard Cable"
If the neon glow is all you desire then Lian Li's Strimmer is the icing on the cake. Avid RGB enthusiasts will adore the extravagance this product brings!